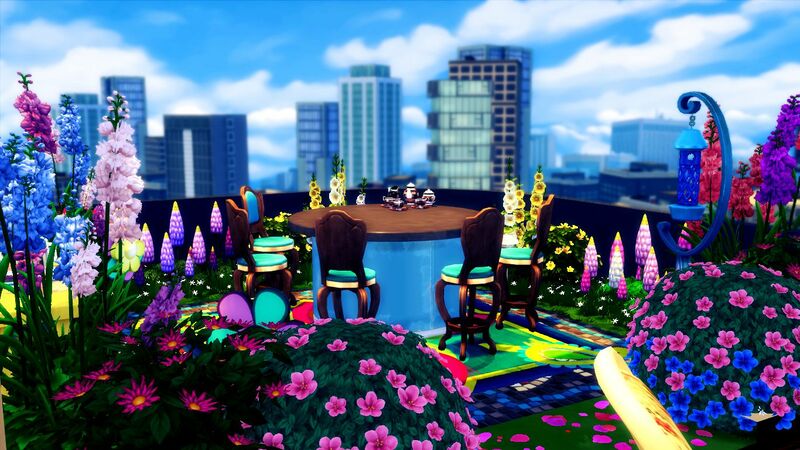 Let your Sims start their day dining for breakfast on this lovely balcony, featuring the breakfast bar surrounded by a beautiful flower garden. When they're home from work, they can relax and enjoy their afternoon tea in the garden. So, add this small but cute Sims 4 outdoor room 'Lovely Morning Balcony' to your Sims 4 house, apartment, or penthouse. 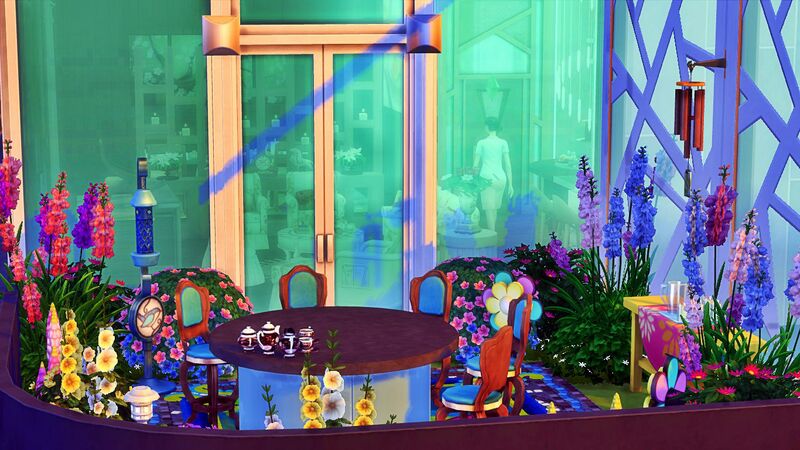 The breakfast bar has functional tea set from my Sims 4 Classic Themed Functional Tea Set, and I also modded some EA flowers so that Sims can easily navigate through the balcony. 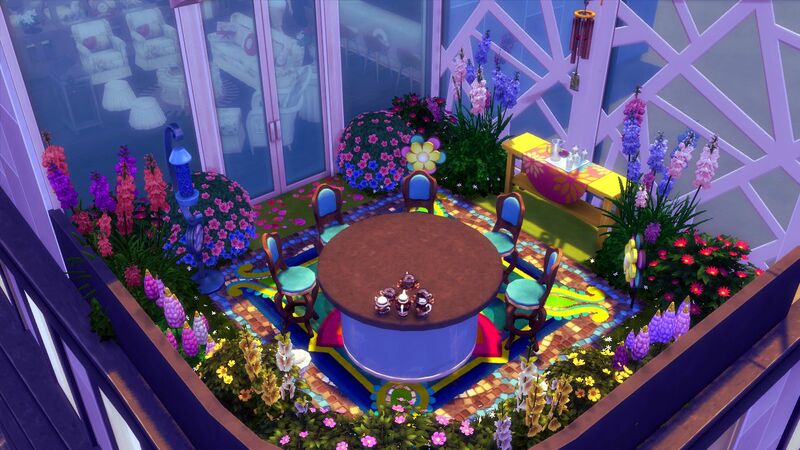 I've included all my Sims 4 custom contents used to create this room in the download file. The download link and install instruction are given after the preview pictures. For installing this balcony, extract the downloaded zip file. Then first install the custom contents and mods used to create this balcony. Copy all the files of the "EA Modded Flower" folder in "Custom Contents" to My Documents>Electronic Arts>Sims 4>Mod folder. From "Classic Tea Set" folder copy all the files of the "Custom Contents File" folder to My Documents>Electronic Arts>Sims 4>Mod folder. Then, Copy and Use Only One mod file of "Default Replacement Cup Mod" folder at a time to My Documents>Electronic Arts>Sims 4>Mod folder. Finally, copy all the files in 'Room File' folder to My Documents>Electronic Arts>Sims 4>Tray folder. Open your gallery library and don't forget to check "Include custom contents" in 'Advanced' tab of the gallery, otherwise this room won't show up in your library. Now place the room in your game through build mode. Please Do Not claim this set or objects as your own and Do Not clone and edit the object meshes. Do Not re-upload the set,if you need to share this set just share a link to this post.